I am the worst decision maker! 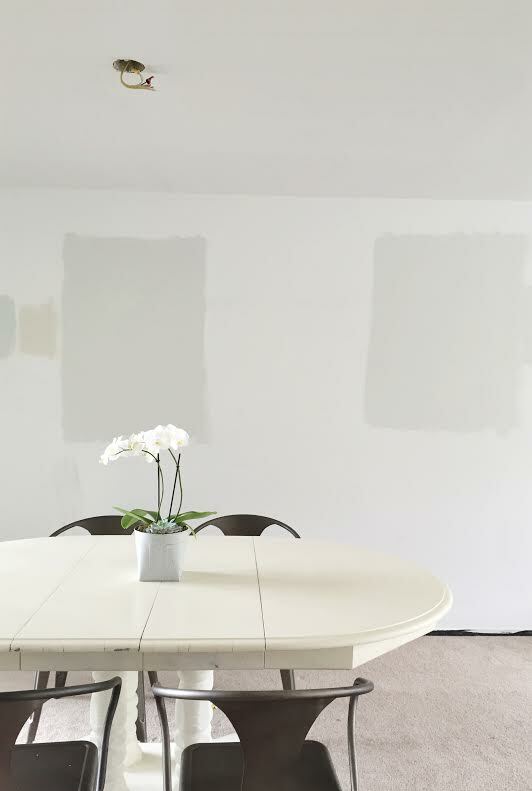 It's so fun to pick paint colors and other little details that we've never been able to choose before in all the places we've rented, but I often can't even choose where I want to eat when we go out, so making these decisions is much harder! Ha! I think I've narrowed it down to these two paint colors (left is Horizon by and right is Paper White - both by Benjamin Moore) but they are both so pretty. I feel like either one will be beautiful but I am leaning towards Horizon, but probably lightened up a bit. Down the road, we're going to get a new dining table. This one is pretty beat up and I think it would work great as a craft table in the basement. We're planning on eventually ripping out this carpet and putting down wood floors and replacing the mill work (it's currently a really outdated black) but I really want it to be bright and light in here. We have lots of windows and this space is on the upper level so it feels like we're "up in the trees" sometimes because of the view from the big windows. It's one of my favorite things about this house. 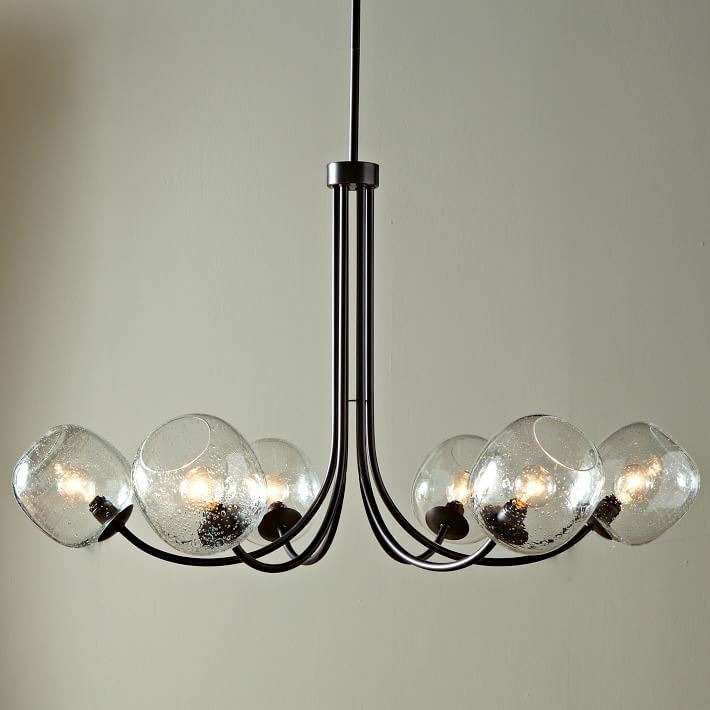 I'm deliberating between these three light fixtures to go over our dining table. I like them all, and they're all about the same price but I just can't seem to decide. What's your pick? They're all super cute. The first one though, I think it looks like your style! :) Second one seems too industrial and the last one has the white shade which I think will add too much white into the room. I really like the contrast between the light walls and the darker fixture. I like Horizon too, and I'd pick the middle option for lighting. I love that fixture! Where is it from? I love the clean, simple, industrial look! I vote for Paper White and fixture #3. But they are all great options so you can't go wrong! Paper white and fixture #3 looks the most like your style. #2 is really cute if you are adding some industrial touches into your design. Either way, ya can't go wrong! 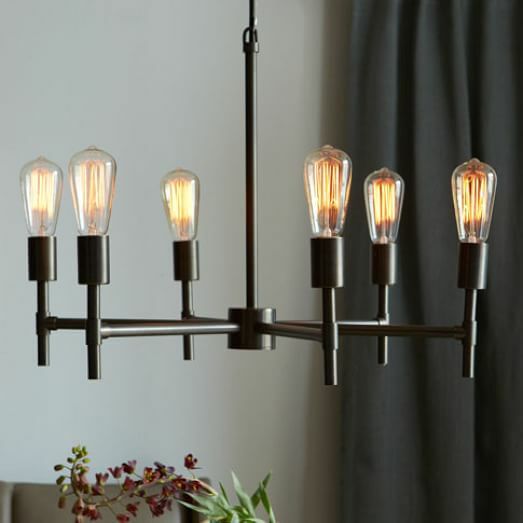 I love the first lighting fixture. I love following your blog. Either paint color is great and I love lighting option #2! I love lighting option #1. It would provide some great light while keeping the bare light bulb from shining directly down onto the table top (something I find can give me a headache when we have lingering dinners at night). Also, I like the dark metal contrasted with the soft curve of the "spokes". Just my $.02! I'm loving that first one! Can you use both the paint colors? They seem to coordinate? I love all the light options, but 3 gets my vote. 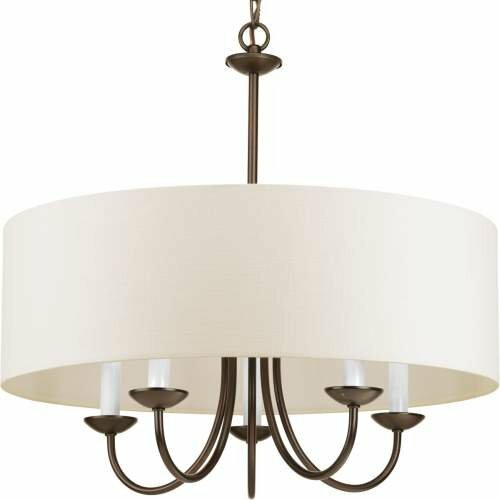 If you're using the chandelier over the table, the lights can really be bothersome since there is no buffer from the shade... They would be better in higher or more elevated ceilings in my opinion...but all lovely choices for sure! Top. My sister has the second one and I'm not crazy about it. All lights are lovely but I prefer number one! I absolutely love the first and second light fixtures. I vote for Horizon and fixture #1. I am so excited to see what you do with this house!